I have three bags of candy. Each bag has 5 candies in it. How many pieces of candy do I have altogether? To solve this problem, I can do many things. First, I could add 5 three times for each bag of candy: 5 + 5 + 5 = 15 candies. I could even draw a picture showing the bags and candies and count up 15 pieces. OR, I can use MULTIPLICATION! MULTIPLICATION is one of the four math operations. We multiply when we have many groups and want to find the total amount. Basically, MULTIPLICATION is like repeated addition. We can model, or show, MULTIPLICATION is two ways: repeated addition and arrays. Another way to model multiplication is using an array. 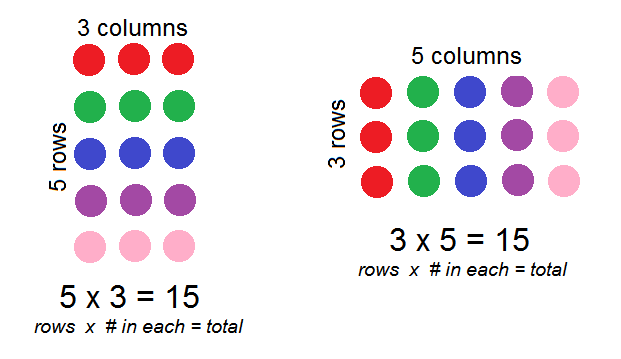 An arrays organizes objects into rows and columns. To find the total number of candies, we can show the candies in arrays. Look at the ARRAYS below which show 3 x 5 = 15 and 5 x 3 = 15. You will notice that 5 x 3 was the same as 3 x 5. We will explore this more on the Multiplication Properties page. Watch the following video on arrays. Click on the button below to take the quick check on model multiplication.